We stumbled upon Elizabeth's work the same way we come across many of our new friends : #thanksinstagram. And contacted her immediately to collaborate for our Dirt Issue of STUDY. Elizabeth is an artist and illustrator based in Napa Valley currently focusing much of her creative time studying plant life. I would personally like to plaster these paintings all over my walls - take a peek and tell me they wouldn't create a dreamy environment to wake up in. Without further ado, meet Elizabeth! Oh boy, where to start. I think I've always been a person of industry; I'm happiest when I'm doing something. Making, building, drawing, painting, gardening, yard work, I even like cleaning the house. I like working on a project and at the end of the day being able to see and hold the thing that I made or did. My first "medium" was probably a crayon or marker and it probably started as soon as I could hold a pen. As a toddler I was a very prolific chalk artist. In more recent years I've worked with charcoal and graphite, then pen and ink. Then watercolor for a bit and most recently gouache (which is essentially opaque watercolor). I've been experimenting with oil paints too, but that's mostly just for fun. When I make illustrations for my field guide project, I start with gouache and add details later with a charcoal pencil. Tell us about your current project #filedguide365. I've been sharing my work on instagram for a while, but towards the beginning of the year I was in a creative slump. I wanted to draw but I didn't know what; I wanted to start painting more but I didn't know how. I needed a project with focus where I could never run out of inspiration. Enter: #fieldguide365. 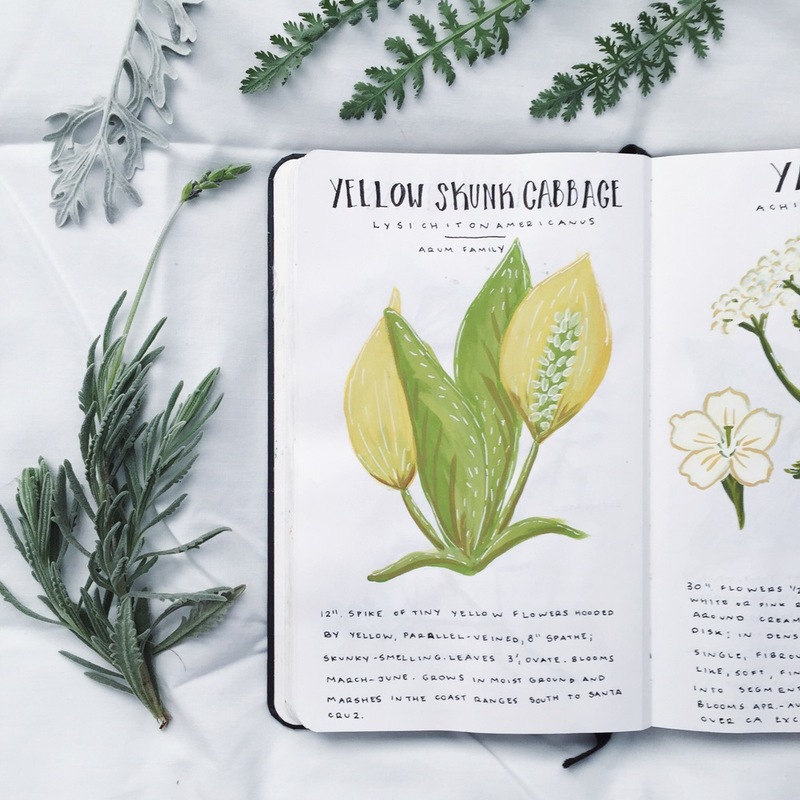 The initial idea was an illustration a day of one of California's native plants. My parents (and I have added to it) have a collection of vintage (and newer) field guides, which have helped me find the plants I draw each time I add to the collection. I don't have time to work on it every day now, but the project has helped me accomplish exactly what I hoped: it got me out of my creative slump, it helped me practice my painting skills (which was a new medium for me when I started), and I've learned a lot about the plants that live in my state. The most rewarding part is seeing how much other people enjoy it and getting to share my love of plants and my home state with my followers on instagram. Haha, specimen is probably the right term (I'm not a scientist either), but I don't always have the luxury of drawing from life. Often times the plant I want to draw doesn't grow where I live, so I rely on information and images from other field guides and flower finders. When I am drawing something local though, there is a great wilderness reserve a couple miles from my house that I love to hike through and collect plants. I'm a fan of plain air art making. It's such a different feeling to be outside recording the thing you're experiencing at that moment. Were you always a lover of plants? Yes, but I'm not sure it was a dedicated interest so much as being outside and part of nature was an expected part of life in our family. Most of our family vacations were to National and State parks, and there's a small part of me that always wants to be back in the mountains. My more technical interest in plants didn't start until my sophomore year of college when I took a botany course (to satisfy a science requirement), and it actually ended up being one of my favorite college courses I took. I was also a Classics major for two years, and a student of Latin, which made learning the scientific names more fun. Any plant that defies our assumptions about it. Flowers in the Asteraceae (or daisy) family, for instance, are actually composite flowers, meaning that what we think of of as a single sunflower, or a single dandelion, is actually many smaller flowers clustered together. Each "petal" is actually a ray floret, which is sterile, and the center of the the "flower" is made up of disk florets which are fertile and produce the seeds. To be honest, all plants are super cool. They live way more interesting and involved lives than most of think. My favorite flower is a poppy though. I'm partial to the California kind. How do you decide which plants to draw/study and how often do you complete an illustration? Most days start with a flip through the National Audubon Society's Field Guide to California. Sometimes I work my way through a certain family of plants, but usually it's just whatever looks interesting at the time. When I first started the Field Guide project, it was at least one drawing a day, but I don't always have that sort of time now, and my drawing schedule is usually more like two or three days a week. Never coffee, always tea. If it's hot, with milk and sugar. If it's cold, I like it black. I just finished classes at UC Davis in March and am graduating in June with a Linguistics degree. Right now, I'm working at a local shop in Napa and working on growing my illustration business on the side. We have a four and a half month old Springer Spaniel at home (who sometimes makes appearances on my instagram), so every morning starts at 6 am when he wakes up; 7, if we're lucky. In the evenings and my days off I work on my illustrations. If I have time I go for a run two or three times a week. Wednesday nights Brodie has puppy school. He just graduated too. I haven't mastered this yet. There are lots of things I want to do every day (draw, go for a run, work in the garden, read a book), and lots of things I have to do (like go to work). Often times my creative time gets set aside to visit friends or see a movie with my mom (we saw Far From the Madding Crowd last week and I'm still dreaming about living in England in the 1800s), but those things are important too. It's especially difficult right now in the midst of graduation season, but I'm learning. I've at least gotten to the point where I can write myself a schedule. I just have to find a way to stick to it. Grab a copy of The Dirt Issue to see her work firsthand.